Join us for a wonderful week exploring the hidden corners of these two amazing Inner Hebridean islands. Mull is wild and beautiful, home to eagles and deer, and its gorgeous west coast has a tremendous feeling of remoteness. Off its south west tip lies the island of Iona, tiny yet exquisite, where St. Columba established the first Christian settlement on Scotland's west coast. This excellent holiday visits both islands, and includes a day trip to the fabulous Isle of Staffa, home of the famous Fingal's Cave and countless puffins! Eagles, puffins & monasteries - just some of the highlights of this fantastic tour of the Inner Hebrides. The Isle of Mull is one of the more southern Hebridean islands, easily accessible by a short boat ride from the bustling mainland port of Oban. However, don't be fooled by its accessibility - this large island has only 2,500 inhabitants and feels impressively wild and remote. Whilst Mull's eastern shores are attractive, tranquil farmland and forestry, it's west side contains magnificent landscapes and seascapes, with some of the remotest settlements in Scotland. The island is also a haven for wildlife, with white tailed sea eagles and otters both plentiful. A short boat ride away is the famous and beautiful island of Iona, where St. Columba first brought Christianity to Scotland, and which today still draws pilgrims from all over the world. Though tiny, Iona retains a very distinctive character - few visitors, religious or not, fail to be moved by its quiet air of spirituality. As with all our walking holidays, the emphasis is on relaxed walking with lots of time to admire the views, take photographs and watch wildlife. We will be covering around 5 - 6 miles at a gentle pace most days. The pick up location for this holiday is the bustling west coast port of Oban. This is easily reached by train from Glasgow. Pick up time is 4pm from outside the entrance to Oban train station. Once everyone has arrived we will take the evening ferry to Craignure on Mull and drive to our accommodation. We will start off with a day walking on the stunning little island of Ulva, a 5 minute boat ride from the west side of Mull. Ulva is a fascinating combination of pastoral farmland, rocky hills and evocative abandoned villages. We will be heading out to explore the remote west side of the island, where we will get amazing views out across the sea to other islands of the Inner Hebrides. On our return we will be calling in at one of Scotland's finest little teashops before catching the wee ferry back Mull. ​Today we will be travelling to Fionnaphort the south western tip of Mull where we will take the short boat crossing to Iona. 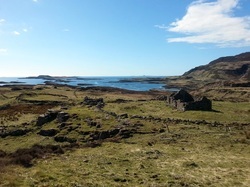 Once on the island we will have a chance to explore several beautiful beaches as well as the stunning Iona Abbey. 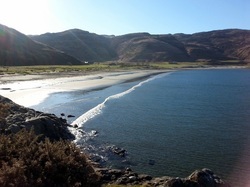 After returning back to Mull we will take a short walk to the wonderful tidal island of Erraid, one of the most beautiful places imaginable and which featured in Robert Louis Stephenson's famous children's novel "Kidnapped". Tobermory is the charming little capital of Mull, made famous from numerous postcards and the popular BBC children's show Balamory. Its colourful houses lining the harbour make it probably the most recognisable town in the Highlands. We will spend a short visit exploring the town before heading over to Dervaig in north west Mull and the wild headland of Quinish Point. 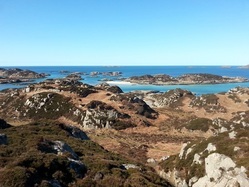 This is a great walk which gives outstanding views of many other Inner Hebridean islands, including Coll, Rum and Skye. Two walks for the price of one today as we explore the southern coastline of Mull. First up is a walk around Lochbuie, a wonderful route at the end of a remote glen and one of the tiniest single track roads imaginable. We will follow this with a lovely walk through coastal woodlands to the spectacular Torosay Castle, with great views along the way out over the Sound of Mull to the mainland mountains. We will finish, weather permitting, with a day trip to the Isle of Staffa and the famous rock formation of Fingal's Cave where Felix Mendelssohn wrote his famous Hebrides Overture. After seeing the renowned cave, with its towering basalt columns, we will spend some time exploring the island and meeting the thousands of puffins who are its only inhabitants. We will take the morning ferry back from Craignure, arriving in Oban at 11:40am. Grade: Easy. This one of our easiest holidays so should be suitable for most people. However, it is still a walking holiday, so it is not suitable for complete beginners or the very unfit. As a guide, you should be able to manage small sections of uphill, be comfortable walking for 4 - 5 hours and 5 - 6 miles or so each day, and be confident walking on rough, sometimes boggy paths. We try to keep to easy ground as much as possible on these walks, but there will be some areas where the going can be a little rough and quite wet underfoot, so good hiking boots are essential. We don't tackle any hills on these walks but there will be some modest uphill sections on a couple of the days. Cost: £995.00 - includes guest house accommodation plus breakfast, packed lunch and evening meals. Single supplement: £120. Please note there is a £30 per person surcharge for the Staffa day trip, payable on the day. Accommodation: We will be staying in comfortable guest houses on Mull. All rooms will have ensuite or private bathrooms. 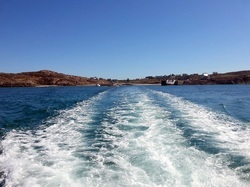 All transport, including ferry tickets (except Staffa day trip: see above) during the holiday, including collection and transfers at the start and end of the holiday. The services of an experienced walking guide. What's Not Included: Transport to / from holiday departure point at Oban. Entrance to any visitor attractions. Travel insurance.